Craftsman 24 in. Dual Fill Push Broom Just $7.88! Down From $22! You are here: Home / Great Deals / Craftsman 24 in. 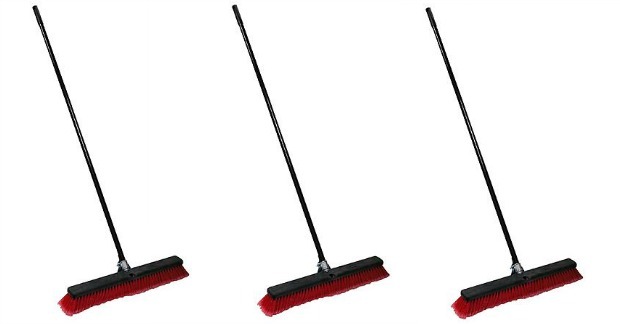 Dual Fill Push Broom Just $7.88! Down From $22! Sears has this Craftsman 24 in. Dual Fill Push Broom for just $10.99 and Shop Your Members can get back $3.11 in points, making it $7.88! Dual fill push brooms combine a stiff polypropylene center with a flagged ( soft ) bristle around the outside. This broom provides the ability to move heavier debris and still pick up small particles of dust and dirt. Use this broom for all general sweeping in the garage, patio, and sidewalk. This broom is made using a plastic block which is light-weight, water resistant and won’t warp, split or crack. The strong metal handle comes with a swivel hanger cap for easy storage. This is an excellent all purpose broom.